Hydraulic fracturing, or “fracking,” is a well stimulation process used to maximize the extraction of underground resources including oil and natural gas. 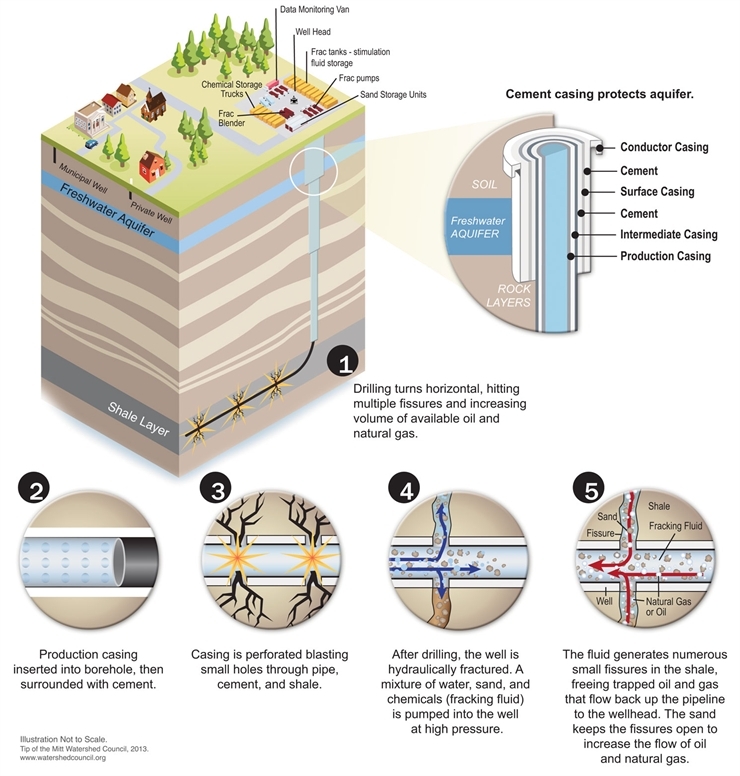 Hydraulic fracturing involves the pressurized injection of a mixture of water, chemicals, and sand in underground formations to allow natural gas and oil to flow more freely from rock pores to the surface. The oil and gas industry defines hydraulic fracturing, or fracking, as the actual process of injecting fluids to create underground fractures. It is not considered to be part of the drilling process, but a technique used after drilling the well is complete. However, the public uses the term fracking to encompass all activities associated with oil and gas drilling, including well construction, hydraulic fracturing, and oil and gas production. This difference can sometimes lead to confusion or lack of clarity in discussions regarding hydraulic fracturing. Hydraulic fracturing is not a new technology. Hydraulic fracturing was first introduced to the petroleum industry back in the 1940s. The technique has been commercially used for over 60 years. However, advancements in technology and new uses have greatly expanded in recent years. For example, multistage fracking within a horizontal well has only widely been used in the last decade. The recent improvements in technology have allowed companies to extract oil and gas resources from areas that were previously inaccessible. The new applications of horizontal drilling and hydraulic fracturing have led to a boom in “unconventional” oil and gas production. 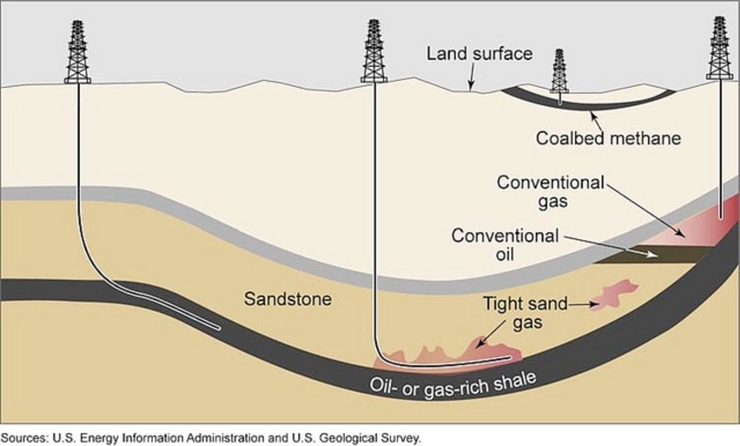 Natural gas and oil comes from both ‘conventional’ and ‘unconventional’ geological formations. While there are no clear and consistent definitions for conventional and unconventional oil and gas reservoirs, the key difference is the manner, ease, and cost associated with extracting the resource. In conventional reservoirs, oil and gas can flow relatively easily through a series of pores in the rock to the well. Unconventional reserves are situated in rocks of low permeability, which makes the gas difficult to access. Unconventional gas reservoirs include tight gas, coal bed methane, gas hydrates, and shale gas. Fracking, coupled with horizontal drilling, has significantly increased natural gas and oil production in the United States. The technological breakthroughs in horizontal drilling and fracturing have made shale and other unconventional supplies commercially viable. Fracking makes it possible to extract crude oil and natural gas from unconventional resources which were previously deemed unproductive or uneconomical. Although hydraulic fracturing is often used in conventional oil and natural gas fields, it is not usually on the same scale as shale layers. While the technique of hydraulic fracturing is quite similar in conventional and unconventional reservoirs, drilling in unconventional formations has unique conditions not typical of conventionally completed wells. This drilling is deeper and requires substantially more fresh water (millions of gallons rather than 50-100,000 gallons), greater volumes of chemicals, and produces larger quantities of wastewater. In Michigan, unconventional drilling is designated “high volume hydraulic fracturing.” According to the Michigan Department of Environmental Quality (MDEQ), “high volume hydraulic fracturing means a hydraulic fracturing well completion operation that is intended to use a total volume of more than 100,000 gallons of primary carrier fluid.” Primary carrier fluid is the base fluid, such as water, into which chemical additives are mixed to form the hydraulic fracturing fluid. The process for exploration and development of oil and gas wells includes leasing, permitting, well site preparations, drilling, hydraulic fracturing, production, plugging, and reclamation. First, operators must locate suitable shale oil and gas targets by collecting seismic data to evaluate an area’s potential for economically producible oil and gas. Once an operator has identified the best location to drill an exploratory well, the operator must negotiate a lease or contract to obtain permission to access the minerals below the surface. An oil/gas/mineral lease is an important legal document that defines the relationship between the landowner or the owner of the mineral rights and the party interested in extracting the oil, gas, or other minerals. The lease defines the rights, privileges, and responsibilities of both parties. Landowners should always seek professional assistance in reviewing the lease terms prior to signing a lease because provisions contained in leases may be unfamiliar and will not necessarily be in the best interest of the property owner. Once access to the minerals is granted by the landowner, the operator must obtain all necessary permits. For Michigan, permits must be obtained from the MDEQ Office of Oil, Gas, and Minerals. The next stage is to prepare and construct the well pad site. This includes clearing a 3 to 5 acre pad of land to make room for equipment such as the drilling rig and building access roads. The operator may also bring in tanks holding sand and chemicals to be used in the hydraulic fracturing process as well frac tanks to store wastewater. Freshwater pits may be constructed to temporarily hold freshwater and drilling muds. Here is an example of a well site and the common equipment found on site. Next, the setup of the rig and the drilling of the well take place. The well is drilled similar to how a water well is drilled. From the well pad site, a vertical wellbore (a hole) is drilled deep into the earth through layers of sediment, the water table, and shale formations. Wells may be drilled in the vertical direction only or paired with horizontal or directional sections. Vertical well sections may be drilled hundreds to thousands of feet below the land surface and lateral sections may extend 1,000 to 12,000 feet away from the well. For horizontal wells, after reaching the targeted formation, the drill is slowly angled and continues drilling horizontally. After the wellbore is drilled, the drill is removed and casing, which is multiple layers of steel pipe, is installed. As the well is drilled deeper, the casing becomes increasingly narrower. After the casing is installed, the next task is cementing the casing in place. The cement is intended to seal off the internal portion of the well from the outlying geologic formations and prevent migration of fluids injected. After a well is fracked, 25-75% of the fluid is returned to the surface along with the oil or gas. The rest of the fluids remain underground. Used fracturing fluids that return to the surface are referred to as flowback. Most of the flowback returns to the surface in the first seven to ten days while the rest can occur over a three to four week time period. Wells are completed for production if the value of the recoverable oil and natural gas is greater than the cost of drilling, producing, and delivery to market. If not, the well will be plugged. The primary activity conducted during the production phase is pumping hydrocarbons to the surface. During production, oil comes out of the well mixed with water and natural gas often comes out mixed with water vapor and other gases. These components must be separated before oil or natural gas can be transported. The water recovered along with the oil or gas is called produced water. Produced water is naturally occurring water found in shale formations that flows to the surface throughout the entire lifespan of the gas well. Produced water is considered a waste just like flowback. The exact point of transition from flowback to produced water is hard to determine, but at some point, the water that is recovered from a gas well makes a transition from flowback water to produced water. In Michigan, when the well moves into the production phase, the waste is considered produced water, even if some remnants of fracturing fluids are present in the wastewater. Produced water generally does not have the chemicals added as fracking fluid during the hydraulic fracturing process. However, this water often has high levels of Total Dissolved Solids (TDS) and leaches out minerals from the shale including barium, calcium, iron, and magnesium. It also contains dissolved hydrocarbons such as methane, ethane, and propane and naturally occurring radioactive materials (NORM) such as radium isotopes. Both the flowback and produced water are considered wastes and must be disposed of appropriately. Wells no longer producing economically or wells that did not produce oil or gas must be plugged. Plugging consists of the placement of cement at intervals in the wellbore to prevent the movement of fluid up or down the well to prevent groundwater contamination and potentially hazardous discharge to the surface. Wells can also be temporarily plugged which allows for the well to be reopened in the future. Once the well is plugged, site reclamation is required to restore the well site to the original land contour and condition, as practicable. The intent is to ensure that the effects of oil and gas development on the land and on other resources are not permanent. The ultimate objective of reclamation is ecosystem restoration, including restoration of the natural vegetation community, hydrology, and wildlife habitats. 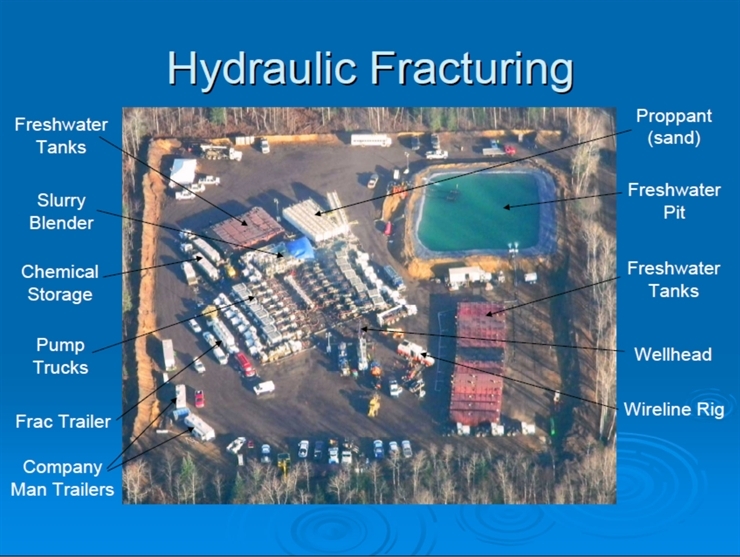 This video from the Michigan Oil & Gas Producers Education Foundation (MOGPEF) illustrates the well construction and hydraulic fracturing process.